Before a pond can be stocked for a new crop, the excessive wastes, which accumulate in the pond during the previous crop, must be removed and the soil and water conditioned. 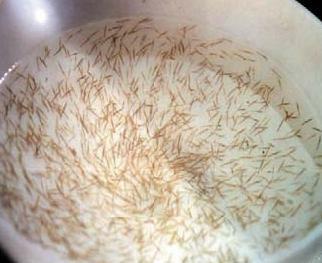 Growing of shrimp in an improperly prepared pond may lead to difficulty in pond management during the culture period, which could result in a decrease in production capacity of the pond. The cleaning of a pond or removal of the wastes, especially the organic and phosphatic wastes that have accumulated in the pond bottom could be, accomplished by drying, liming and ploughing. However, these methods could still leave an adverse effect on the water and soil quality in the pond, which could result in a decrease in the production capacity of the pond. 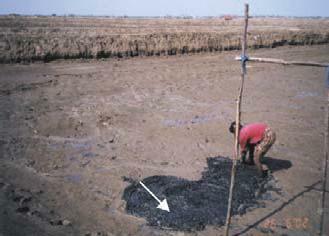 This method is used when the pond bottom can be dried completely. The pond is drained and left to dry in the sun for a period of 10-30 days. Then the waste is removed, either manually or mechanically, and transported to the waste dumping area. Removal of waste by machines has an advantage that it can compact the bottom soil. However, this cleaning method by drying may lead to development of acidity, lowering the level of the pond bottom and the diffusion of wastes if the workers are inexperienced. In areas where the pond cannot be dried completely, pressure washing can be used to flush out the wastes. This method takes a shorter time and is more efficient than the dry method. Flushing should be continued until the acid and dark anaerobic layer in the soil are removed. This method is suitable in the acid sulfate areas where the oxidation of the soil must be avoided. However, the method requires a sedimentation pond to all settlement of the suspended wastes to avoid contaminating the drainage canal and the natural environment. 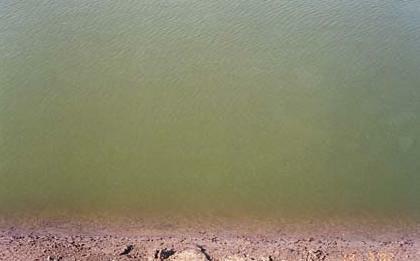 The remaining pathogens in the ponds can be eliminated during the liming process. Once the pond is cleaned, it is then filled with water and left overnight before flushing out to remove debris and elevate the pH. 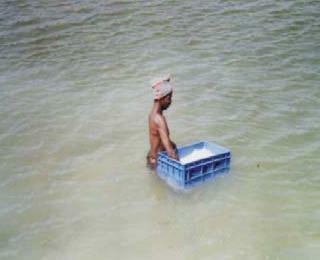 This process should be repeated until the pH of the water remains above 7, and only then the lime is applied. The types of lime to be used depend on the water pH. It is recommended that agricultural lime (CaCO3) or dolomite [CaMg(CO3)2] should be used in a pond with water pH near neutral and the hydrated lime [Ca(OH)2] should be used in a pond with water pH below 5. The amount of lime to be used should be carefully calculated to avoid inducing an excessively high water pH, which may increase ammonia toxicity and result in the mortality of the shrimps. The lime requirement of a pond depends on the soil pH. The measurement of the soil pH should be determined either by the wet soil method or by the dry soil method. 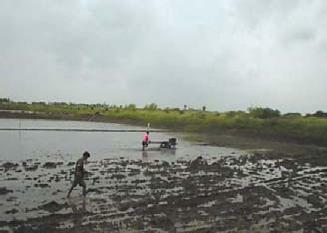 During the application, lime should be spread throughout the pond bottom and up to the top of the dike. 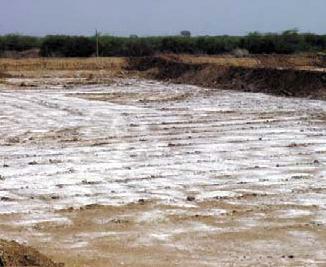 A large portion of lime should be applied over the feeding areas and to all parts of the pond that have remained wet. When the pond is properly limed and filled with water, the average water pH should be between 7.5-8.5 with daily fluctuation of less than 0.5. 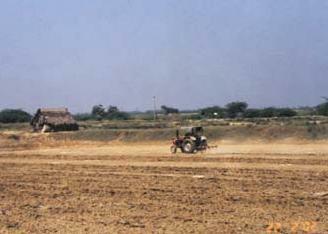 Agricultural lime, dolomite or hydrated lime at 100 kg/ha/day should be added to maintain the required pH. After liming, the pond should be filled to the maximum depth through a screen with fine mesh to prevent the predators and competitors from entering the pond. These animals, including fish, crustaceans and some invertebrates, may compete for food, prey on the shrimp or carry diseases and parasites. They may establish themselves in the pond that is not effectively screened effectively or is left for a long period of time. Some chemicals should be used to eradicate these animals in the pond before stocking. Fish can be killed by the application of tea seed powder at the rate of 20-30 ppm. After the application of tea seed, the pond should be left for 3 days before the post larvae can be stocked. Tea seed may also be used when the shrimp has reached a weight of more than 2 gm. However, it must be remembered that tea seed is more toxic at high salinity and temperature, but less toxic at high pH. Application of tea seed in the evening may reduce pH and result in plankton die-off. Snails can be eliminated by the application of quick lime (CaO) at 530 kg./ha and sun dried for 2-3 days. Then the pond should be thoroughly cleaned, filled with water and the other pests eradicated. Hypochlorite, either calcium or sodium salt, is currently used at 15-20% (60% active ingredient) to eliminate both vertebrates and invertebrates. The pond must be cleaned prior to the application of hypochlorite since hypochlorite may react with the organic matters and produces the toxic organochlorine compounds. 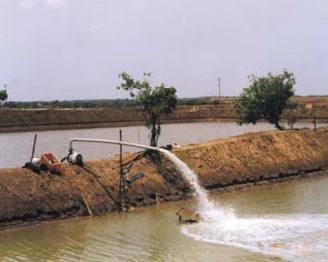 Hypochlorite should be applied after the pond is filled to the maximum height and left for 3 days to allow the hatching of planktonic organisms. It should be remembered that hypochlorite should be used prior to the liming since the effectiveness of hypochlorite will be lowered in high pH conditions. After the hypochlorite application, the pond should be aerated and the application of lime and fertilizer should be conducted on Day 3, while the PL can be stocked on Day 7. During the first month, water must not be added to the pond, unless the water quality is poor, to prevent the introduction of competitors and predators. The pond must be fertilized with either organic or inorganic fertilizer to stimulate the plankton bloom in order to provide shade to the pond bottom and utilize the nitrogenous and phosphate wastes within the pond. The shade will also prevent the growth of harmful benthic algae. The sun dried chicken manure is the most common organic fertilizer to be used in the amount of 200-300 kg/ha. 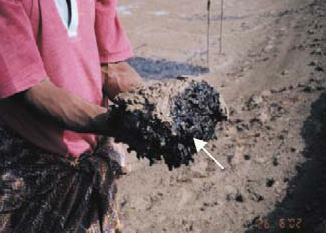 The manure must be soaked in water for 24 hours before it is spread over the surface of the water. Inorganic fertilizers, such as urea (46% N) and compound fertilizers like, ammonium phosphate (16:20:0) or those with N:P:K combination of (16:16:16) can be used at 20-30 kg./ha. The fertilizer must be dissolved in water before it is spread over the water surface to avoid precipitation of the fertilizer onto the pond bottom, which will enrich the soil and accelerate the growth of benthic algae. After fertilization, the plankton should bloom within a few days and the color of the water becomes slightly green. The fertilizer, either the organic or inorganic, should be applied daily in the pond at 5-10 % of the initial amount to maintain the plankton bloom. If the plankton has not bloomed within a few days, additional fertilizer must not be applied, but plankton rich water or green water from the reservoir should be added. A 0.5-1.0 ha pond would require, four aerators installed at the corners of the pond, approximately 3-5 m from the bottom of the dike and positioned at an angle that will encourage the maximum water flow within the pond. The type of aerator to be used depends on the depth of the water. One horsepower paddle wheel aerators should be used in ponds of less than 1.2 m water depth and the 2 HP (horsepower) paddle wheel aerators should be used in ponds deeper than 1.2 m. The most popular type of aerator is the long arm paddle wheel aerator, which is driven by a 2-10 HP electric, or diesel motor mounted on the dike. The aerators should be switched-on 24 hrs before the PL are stocked to allow enough time to create the current and clean up the feeding area.